“On Saturday, four men set out to sail on Florida’s Gulf Coast, and when they did not return at dusk as expected, search teams were called out. Two days later, one survivor was found. After several days of searching, the other three men – two of which were NFL football players – are now presumed to be dead. Nick Schuyler, 24, the lone survivor of the tragic boat trip said that the men had tried to pull their anchor out of the water when a strong wave flipped their boat. He told officials that the others had been clinging to the vessel for at least eight hours until they became separated overnight. Schuyler also said that the men were not wearing life jackets at the time the boat capsized, but they did swim underneath to retrieve them and put them on. They pulled out four life jackets, and all four put them on. Schuyler was rescued on Monday, and after continued searching throughout the day did not turn up any of the other three men, officials said Tuesday that they were ending the search. Missing and now presumed dead are Will Bleakley, 25, a former University of South Florida football player, and two NFL players, Marquis Cooper, 26, an Oakland Raiders linebacker, and Corey Smith, 29, a Detroit Lions defensive end. The Coast Guard recovered a dark nylon jacket, a cooler, and an orange life vest. 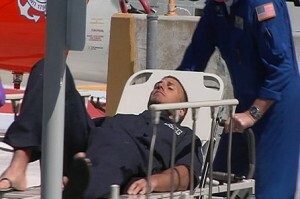 They fear that hypothermia may have set in amongst the missing men after three days in the water”. I mentioned my views on one of my previous Blogs but I feel more should be told since I’ve read something today that supported one of my visions.. I don’t see exactly what happened to cause the boat to capsize but it’s the actions after it went down that troubled me…. After Schuyler got on the hull he kicked the others away from the boat since it would capsize or sink more.. Since the water was pounding the boat and everyone trying to hang on, once they were pushed away several times they could not get back to the boat and were swept away…. When I saw Schuyler on TV it occurred to me that he was in deep thought and trying to figure out what to say…It was obvious to me that something wasn’t right about what the press was reporting…. Two NFL players may have died just a few hours after the fishing boat they were in overturned in rough water, possibly before rescuers were even alerted that they and two others were lost off the west coast of Florida, according to Coast Guard records of the boating accident. In a 23-page report provided to The Associated Press Monday under a Freedom of Information Act request, the Coast Guard documents two conversations it had with Nick Schuyler, a former University of South Florida player who was the lone survivor. Schuyler told them that one by one, the other men took off their life vests and disappeared during the ordeal. The report says the group went roughly 70 miles — or 62 nautical miles — to fish for amberjack on Feb. 28. Also onboard the 21-foot Everglades boat were Oakland Raiders linebacker Marquis Cooper, free-agent NFL defensive lineman Corey Smith, who played for the Detroit Lions last season, and former University of South Florida player William Bleakley. Around 5:30 p.m., the report said the group ran into trouble: Their anchor was stuck. Schuyler told investigators that he believed it was caught in a coral reef. They tried to free it, but water filled the boat and it capsized. Tossed into the frigid water, the men managed to grab their life vests. Schuyler said they held on to the boat for four hours. But as the night wore on, their will to survive appears to have weakened and the effects of hypothermia were likely setting in. Schuyler told the Coast Guard that one of the men “freaked out” and took off his life vest and disappeared that night. Another one of the men started getting unruly and throwing punches later. Schuyler told the Coast Guard the second man also took off his life jacket, dove under the water and was never seen again. The third man thought he saw land nearly two days after the boat capsized and decided to swim for it. Officials have said that they eventually found three life jackets; one on Schuyler; another near the boat and a third underneath it. The bodies of the three who disappeared have not been found. It’s unclear how accurate the account is. Schuyler, who was found clinging to the overturned boat about 35 miles off Clearwater and nearly 48 hours after the accident, was suffering from hypothermia and he has provided different accounts to the men’s relatives. The family of William Bleakley, for example, said Schuyler told them that their son held on to the boat with his college teammate until he weakened and died. Schuyler has also said that Bleakley helped him survive, talking to him and encouraging him during their last night together. Marquis Cooper’s father has questioned Schuyler’s account that his son removed his life jacket. Schuyler has not responded to interview requests. As the men struggled in the water, their relatives grew worried. The group was expected home around sunset. One of the men’s family contacted the Coast Guard around 1:30 a.m. on March 1 and a search began. The Coast Guard records document their repeated attempts — and frustrations — as they attempted tried to find the small white boat in a stormy sea with heavy cloud cover and whitecaps making it tough to spot the vessel. Initial information the Guard received indicated the men were en route to a dive wreck about 58 miles — roughly 50 nautical miles — from Clearwater Pass, Fla.
One of the men’s wives was able to find a handheld GPS device that he had left at home and had apparently used in previous trips to record the coordinates of favorite fishing spots. The Coast Guard used that data to refine their search, placing the likely location of the men about 10 nautical miles south of their expected destination. “Being that these guys are inexperienced, don’t look just at 50 NM offshore, there might be a possibility that they wisened up and stayed close to shore, at least within visual of land,” a Coast Guard officer wrote in one e-mail. The newly released records reveal how the conditions hindered their mission. In one early search, rescuers were only able to cover 40 percent of their search area because of a storm front that moved in. One aircraft had an engine problem and never got out. A second aircraft was used but had problems with its radar during the first leg of the search; an alternative device proved useless in the poor weather. At Tampa General Hospital, Schuyler’s doctor called it a “miracle” that he survived in the 63-degree Gulf water for nearly two days, and said he probably could have lived only another five to 10 hours. The part about the Football players taking off their life jackets was also not true, it will eventually be found out that some of the jackets were not used…. The part about the players: “Another one of the men started getting unruly and throwing punches later” was true because they could not get on the boat because Schuyler was kicked them off!…. Since the beginning of this accident I’ve heard a woman’s voice or presence on that boat at some point. I don’t know if they met up with another boat while in the water or if it was before they went out to sea? The other part that doesn’t make sense was if Schuyler was suffering from hypothermia then why was he not covered in a blanket in the picture above when he was going to the hospital?? The water temperature was 63 degrees but he was on the boat and in the sun during the day.. The families should keep pushing for a full accounting of the facts in this case, the truth is not known…. fire communicated in the article I read. it simply me or do some of the comments come across like written by brain dead folks? No, I believe that everyone comes from different points of view and sometimes they may not be very articulate or clear about what they write but that doesn’t concern me since my goal is to help people understand things that aren’t taught in school or that they cannot by themselves concerning the Paranormal or Spiritual topics. Right now, I don’t have a lot of time to post on social media sites and try to keep this website as my primary responsibility, Thank you!..